From April 2012, a year after the Great East Japan Earthquake and Tsunami, the Research Center for Regional Disaster Management became a university-wide institution from an affiliated entity of the Faculty of Engineering. Full-time and part-time faculty members, research assistants, and visiting professors from inside and outside the university are all advancing research and education that contribute to regional disaster management as well as to the recovery and reconstruction after the disaster. One of the main features of the Center is its focus on regional disaster management, as its name also suggests. Tsunami, volcanic eruption, flooding and other forms of natural disasters tend to be region specific in terms of their occurrence as well as regarding the process of recovery and reconstruction that follows. Thus, the Center is engaged in disaster management research and education that is built on regional characteristics specific to Iwate and the Tohoku area. Many of our faculty members value a long-term engagement with familiar fields, identifying challenges that regional disaster management faces, and seeking solutions to improve the situation. The Center consists of three divisions including Natural Disaster Analysis Division, Community Development and Disaster Management Division, and Disaster Culture Division. Since the occurrence of the Great East Japan Earthquake and Tsunami, our faculty members in the three divisions have been working together with local residents in the form of field studies assessing the degree of devastation in affected areas, and also through analyzing earthquakes and tsunami, supporting community development and reconstruction, giving educational support and support for keeping oral and written records. Hence, our mission is to become the research hub for Iwate s regional disaster management as well as the platform for reconstruction in the Sanriku coastal area and other affected areas in Iwate. Our goals in the immediate future include advancing research and education together with local communities in order to accelerate post-disaster reconstruction works. We also consider it important to strengthen partnerships with other universities inside and outside Japan, such as those which went through the Great Hanshin and Awaji, Niigata Chuetsu or other earthquakes and reconstruction processes, and also with regional universities that are concerned with possible Nankai Trough and other earthquakes. We seek to develop these partnerships to create a common learning ground that is coherent through the past, present and future. 地域防災とは　What is regional disaster management? 一方こうした「自然現象からみた防災」の観点での研究成果を踏まえ、地域ごとの具体的な防災計画を策定するためには「地域住民から見た防災」、つまり地域防災の観点が必要です。地域の地形、産業構造、歴史・文化などを考慮し、津波に災害に強い（1）施設づくり（2）まちづくりと、地域固有の災害文化を醸成・実践・継承する（3）ひとづくりを機能的に連携させたボトムアップ型防災システムが、ここで提案する地域防災です。Existing disaster research institutes have studied scales and probability of earthquakes/tsunami, and contributed greatly to the development of fundamental policies for disaster preparedness. While such research outcomes toward disaster management by viewing disaster as a natural phenomenon provide the ground for drafting actual disaster management plans specific to each region, disaster management from the community s perspective or in other words the aspect of regional disaster management must form a core part of the disaster management plans. The disaster management model that we suggest is a bottom-up disaster management system that takes the geographical traits, industrial composition, history and culture of the region into consideration and creates functional liaisons of 1) facilities and 2) communities that are resistant to tsunami disasters and 3) human resources who create, practice and pass down a disaster culture that is intrinsic to the community. 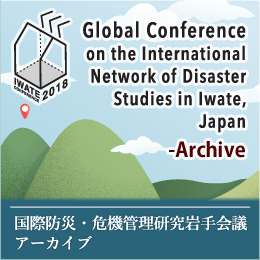 The aim is to expand practical disaster management activities of local communities which have been implemented by the faculty members of Iwate University. These activities concern support for the construction of disaster management systems, the education of disaster prevention and mitigation, and contribution to the development of facilities, communities and human resources for recovery and reconstruction in the devastated areas struck by the Great East Japan Earthquake and Tsunami in 2011. Constructing community-based and bottom-up disaster management system for residents living in areas frequently struck by tsunami, based on their traditional disaster culture. Transmitting information on disaster prevention practices accumulated in the Sanriku area to communities which will be possibly struck by huge earthquakes in the near future. 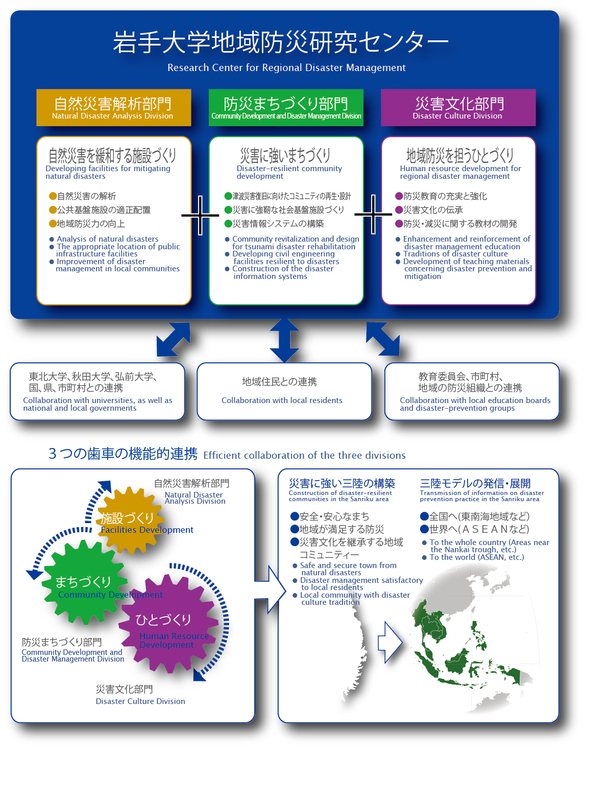 Functioning as “the International Center for Disaster Prevention Research” planned by the Iwate Prefectural Government. And creating fruitful results by collaborating with other universities and research groups.